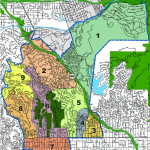 Committees are the lifeblood of the Hollywood Hills West Neighborhood Council. Most issues that come before the board will come from the committee level. From this page you can learn about our various committees or find out when they are meeting. Every Stakeholder is a member of the area committee that covers the specific area in which they live. Additionally, stakeholders can also be a member of two issue committees. Click this Find My Area link to see an interactive map to determine your area. Then scroll through the list of Issue Committees to find two that match your interests (NOTE: you can join 1 Area Committee and up to 2 Issue Committees). There is a mail list for each committee (18) and 1 main HHWNC list. When you sign up, you will be given a chance to subscribe to all our mail lists during the signup process. And whenever you get an email from any of these lists each will have an opt-out link at the bottom of the page which you can click to unsubscribe easily.